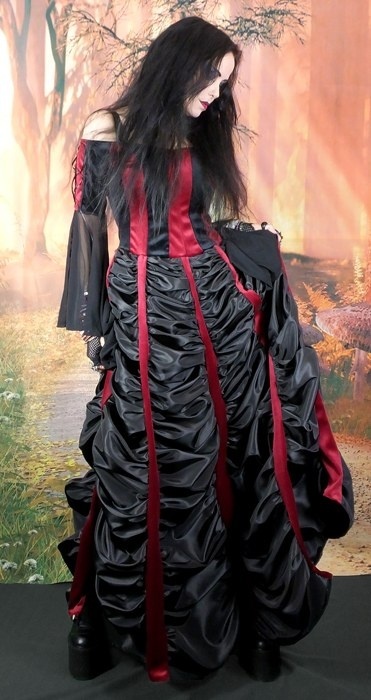 Goth to the max - the Mausoleum Gown.... woah there people, this is too much!!!!! Our stunning Mausoleum skirt, attached to a beautiful bodice with corset fastenings on the upper sleeves and stunning net cuffs. The skirt part is made from gorgeous taffeta, and rouched up to within a inch of it’s life lol!!! The Bodice is made from contrasting steam panels, with the upper sleeves detailed with braided looping and laced up with ribbon. The net sleeves finish this stunning gown off to perfection. It’s totally Goth and totally Gorgeous! ENJOY!! !